Brief Description: Are you a life-long Spurs supporter? Is Tottenham Hotspur your local football club? Have you followed the team’s progress in the 2012/2013 season or gone to watch them play? If so, you won’t want to be without this new quiz book. 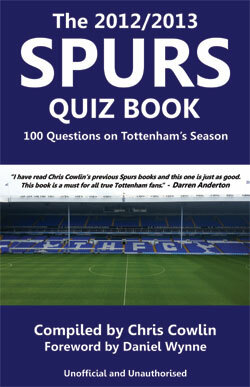 Relive all the highs and lows of Spurs 2012/2013 season with the 100 challenging questions in this book, covering all aspects of the club’s performance including the players, goalscorers, away action, home games, wins, draws and losses. With a fitting foreword by Spurs TV commentator, Daniel Wynne, this book focuses exclusively on the events of the 2012/2013 season and, as all the questions centre around the club’s recent performance, this book can be enjoyed by Spurs fans of all ages. Forget those ‘before my time’ excuses and find out how much you really know about your favourite football club’s current form. So, brush up on your knowledge and impress your family and friends with the fascinating facts in The 2012/2013 Spurs Quiz Book. A must-have for all fans of Tottenham Hotspur FC. About the Author: Chris Cowlin is an author, actor and entrepreneur. Born in London in 1980, Chris has achieved a great deal in a short space of time. With a background in printing and advertising, Chris owns a successful publishing company and is himself the author of 120 books. Chris has written on a range of subjects but specialises in football, sport, television and music. His books have been endorsed by many celebrities and sports personalities such as Jonathan Ross, Sir Alex Ferguson, Gary Mabbutt and Gary Lineker. His writing credits include a foreword for a book by notorious criminal, Charles Bronson, who Chris visited in prison on two occasions. He is also a regular contributor to The Sun, Daily Mirror and the letters page of local newspapers. Chris now lives in London, and has two children, Harry and Aimee. Describing every kick of the 2012/2013 season was mostly an enjoyable experience! From day one at Newcastle to the very last kick at home to Sunderland, AS ever with Spurs there were highs and lows and twists and turns, but we wouldn't have it any other way! This great quiz book tests the knowledge of every fan, looking at the great games, the head coach, players and so much more. Some questions even cause dmd a problem or two! This is a must read for every Spurs fan and I hope you enjoy it as much as I did.